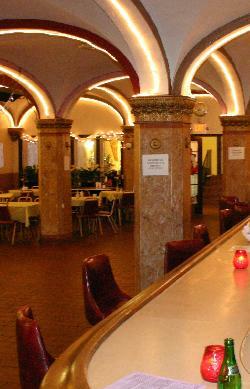 The spacious club lounge features a rathskeller style vaulted ceiling and serves up both Ukrainian and Polish beers regularly. The Dnipro Ukrainian Center, located at 562 Genesee Street in Buffalo, represents one of the finest ethnic clubs in the region. The building was built in 1914 as the Fraternal Order of Orioles Nest #1 by prominent German business leaders, and purchased by the Ukrainian American community in 1955. Most of the founding members were recent immigrants to America that had been displaced from their Ukrainian homeland by World War Two. They sought to establish a community center where they could maintain their cultural identity, pass their heritage onto their children, socialize, and organize political structures that would continue the struggle for an independent Ukraine. So it was natural that they would name their new Ukrainian Home after the largest river in Ukraine; which flows past the capital of Kiev south to Odessa, and empties into the Black Sea. Over the course of the past half-century, DNIPRO has hosted hundreds of profound and life-changing events; such as weddings, christenings, concerts, movies, childrens programs, banquets, lectures and meetings. For decades, almost anything important that happened in the Ukrainian American community in Buffalo, happened at DNIPRO, or was intensely discussed at DNIPRO. One of the highlight of Dnipro is its valuted member lounge that has a distinctive Western European feel. This is not by chance as the Genesee-Jefferson neighborhood was a flourishing German neighborhood at the time of the buildings construction and was home to activities of a regional bund. In fact, the Deutsch-Amerikanischer Volksbund under the guidance of Munich-born Fritz Kuhn was established in May 1936 in Buffalo. Kuhn, after leading American Nazi rallies in other large American cities, was indicted on embezzling funds from US Nazi organizations. Another interesting note of history: In November 1922, the building was the site of a meeting of the National Businessmen Association of America - A front for the Ku Klux Klan. The building was also the home of the Buffalo Germans professional basketball team.